If your products need cushioning protection throughout the transit cycle, you can choose from the NewAir Infatable Bubble System or the Pack Tiger quilted paper system. Both systems offer a high level of product protection in a cost effective, environmentally responsible way. Alternatively, if you are looking for a clean, easy to use void filling system for less damage prone products the range of Fill-Aire systems offer the perfect on-site, on-demand solution. The NewAir I.B. 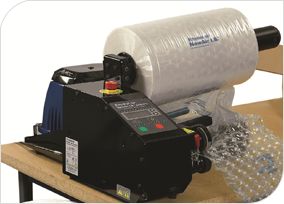 Express Packaging system automatically inflates and dispenses Barrier Bubble inflatable cushioning. With film widths of 300mm and 600mm, and at speeds up to 20 metres per minute, the system is fast enough to keep up with the most demanding packaging operations. The small footprint and variety of batching options make the NewAir I.B. Express system the perfect fit in almost any packaging environment. The NewAir Express has a compact footprint of less than 0.6m2. This compact design fits comfortably on a tabletop, or can be supplied with a table-side stand. A single film roll can produce 456m2 of extra large bubble material, creating on-demand packaging that saves storage space and handling. 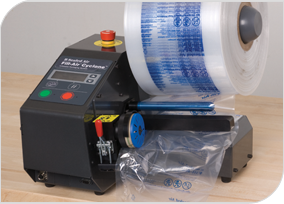 The PackTiger® RS is the fastest paper packaging system in the industry. Capitalising on Swiss design and engineering, the PackTiger® RS creates up to 150 custom length paper pads per minute, which can be used for a variety of packaging techniques, including cushioning and blocking & bracing. 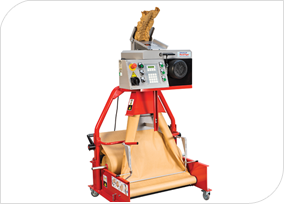 The PackTiger® RS features an easy-to-use control panel that stores up to 24 custom pad configurations. In manual mode,creating pads is as simple as pushing a button or foot pedal. The PackTiger® RS can also be run in automatic mode, using easy, one touch access buttons for frequently-used pad configurations. The bottom-loading design creates fast material changeovers, getting you up and running in no time. The Fill-Air Cyclone® inflatable packaging system produces 20 metres of inflatable void fill cushions per minute in a variety of sizes – fast enough to keep up with the most demanding packaging operations. The small footprint (less than 0.13m2) gives you the flexibility to use the Fill-Air Cyclone® system on demand in decentralised tabletop environments, or online for increased efficiency. Fill-Air Cyclone® film is available in four film widths and can be converted to two different cushion lengths, creating eight possible cushion sizes; the largest measures 350 x 200mm.